"Many kite strings are coated with metal or crushed glass mixed with glue, to help cut the strings of rival kites in hotly-contested flying contests. And in the past five years, flyers have started using nylon strings laced with glass, which are stronger, and more dangerous, than regular kite strings. These strings do not snap easily, and have been blamed for the recent deaths." As we know, in most parts of Asia H&S is just none existant.. anything goes.. but this is just shocking! Lacing kite string with glass, i mean WTF are these idiots thinking!? Welcome to traditional Indian kite flying. Manja is the standard, but illegal now, kite line. It is linen line with powdered glass on it. Readily available in the streets, it is why kite fighting exists, you cut each other out of the sky. surely if its a "competition" then shouldn't the lines be inspected beforehand! That would stop it altogether if they know they will disqualified..unbelievable! Thief, let me slightly correct you. Manja is indeed illegal in some Asian countries (Pakistan), but not all. For instance, the traditional linen manja is legal in India. It's "Chinese manja" made of polypropylene that's been banned. The linen line has a relatively short lifespan after it rains, but the poly stuff lingers on. The manja-related deaths aren't usually kitefliers. When a cut gets cut and drifts away trailing line, it has to land somewhere. The line gets draped across trees and buildings, hanging in the street. And since EVERYONE rides scooters and motorcycles, they go zipping down the road right into a strand of manja they can't see, and it cuts their throat. A lot of the scooters/bikes have a wire loop sticking up from the handlebars to catch the manja and push it over the riders' head. Other people wrap cardboard around their necks. Police are given special training for these kind of injuries. And sadly, there are also people killed in falls from the rooftops -- there are rarely guardrails -- probably greater than the number of manja deaths. Despite that, kiteflying culture on the Asian subcontinent is amazing, and every kiter should experience it. 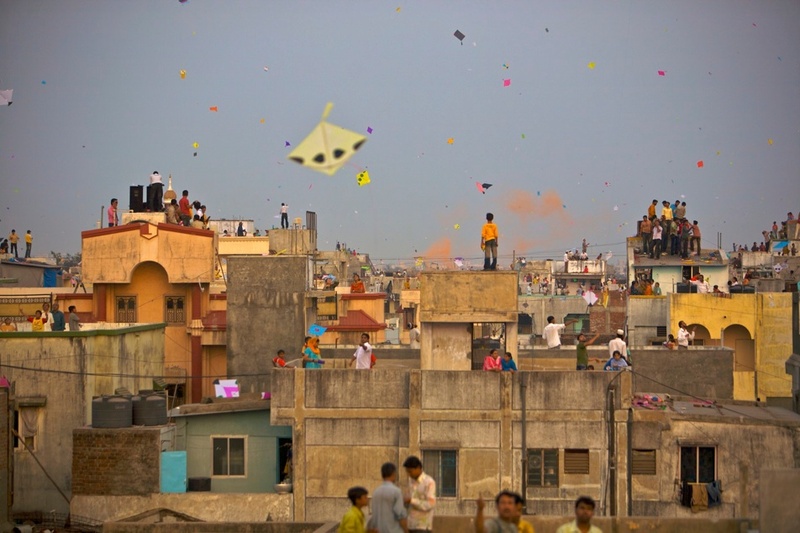 There's a huge kiteflying holiday every January 14 in India, and in Gujarat they run a large festival. They pay for international kiters to come participate (I've been three times). If you get the chance, I encourage people to go. It's a bit of a shock to the system, but it's unbelievable being in the midst of 4 million people all flying kites at the same time. Don't just look at a picture and tell yourself it's too dangerous. It's really something to be experienced. Lacing kite string with glass, i mean WTF are these idiots thinking!? Kite Fighting is as mainstream is some cultures as Baseball or Bowling is in the U.S. In years past it has been more the falls from rooftops that has prompted public safety uproar, and there is a lot more regulation than in the past, but also the legacy art and craft of kite building and flying is fading. It's not just cheap imported synthetic line, but cheap imported kites. I did look into a bit, & lacing the lines with glass has been banned in many parts, even kite flying in some areas because of it, yet they still do it..
other sports where there have been deaths etc, new safety measures are usually implemented to help prevent further deaths, but as these stories tell, kite flyers in certain parts of the world dont give a toss even after bans have been put in place, you can still see them openly manufacturing this "banned" kite line freely in the streets. like i say, idiots tbh. They're not manufacturing "banned" line in the street. They're manufacturing traditional cotton line. It's an art form. It's not a problem in India. But they also continue to import Chinese manja, which is banned. Name me a country in the world that doesn't have a problem with people importing things that have been banned. You're calling a billion people "idiots", Tizdaz, without having been there to see real kite fighting happening, or even knowing much about it. I'd say that's idiotic. As opposed to, say, vehicle drivers? People walking around their own house? But in that same region over 8000 people die in road accidents every year, and 120 of those deaths are attributed to pot holes. Edited my post, simply because i ain't starting a mud war or trying to educate why glassing line is a bad idea lol. If you think its all dandy to line kite line with glass, your opinion. Comparing it to anything else & trying to justify it is quite shocking tbh. What would people say, if this happened in a buzy park in US for example, some guy/gal flying there kite with glassed line, line whipped across a childs throat while they were having a play around in the park & slit the childs throat causing death, would people still compare it & try to justify it etc, I don't think they would somehow! My thought on it, that anyone who does so, are complete muppets. A couple of years ago I was flying my Robertshaw Rev 1 when I was approached by a family from Pakistan who were visiting relatives in nearby Vancouver. They had taken a day trip up to the Sunshine Coast where I live and stopped when they saw my kite in the air at the beach. They were very cool folks but couldn't understand why I was flying this (relatively) expensive kite all by myself in a very light wind to music. They were apparently quite avid kiters back home and partook in kite fighting as that was part of their ancient culture they explained. They inquired if I did any kite fighting and if we westerners "fought" with multi lined kites so I told them about competitions and touch line fighter kiting. I informed them the only thing close to their way of flying was a Rok battle and they got that. We had a great and informative 15 or 20 minute chat about their very ancient and humongous kite culture and customs and our very newbie and quite small kite culture and customs.